Proposition 112 - the ballot measure to increase the distance oil and gas operations must be from homes, schools, playgrounds, even canals and creeks - has an opposition ad. CLAIM: "I'm Reverend Patrick Demmer. Proposition 112, compels me to speak out." It's not a claim, but we got a question wanting to know why a Reverend can be in a political ad. He is the star of a "No on 112" ad paid for by Protect Colorado, which opposes the ballot measure to increase the setback for oil and gas operations to 2,500 feet. VERDICT: It's OK as long as it's not an endorsement of a candidate, but even then, it might be OK.
Reverend Patrick Demmer is the Pastor of Graham Memorial Community Church of God in Christ in Commerce City. We reached out to attorney Cara Lawrence, who specializes in legal issues for charities and nonprofits. "Religious leaders, such as pastors and ministers are allowed to engage in lobbying, so supporting or opposing ballot measures is considered lobbying, so any religious leader can actually do that," said Lawrence. "501(c)3 organizations which include churches, some schools and charities, are allowed to support or oppose ballot measures and engage in lobbying, they're only allowed to do so, under a certain amount." In full disclosure, Lawrence works at Tierney Lawrence and Martha Tierney worked as the attorney that helped Proposition 112 qualify for the ballot. Lawrence had no roll in Proposition 112. "They are not allowed to support or oppose candidates for public office or political parties. In May of 2017, the President passed an executive order basically telling the IRS not to enforce that rule," said Lawrence. "A lot of people or a lot of members of congregations don't necessarily like their religious leaders doing that, that's a separate question, but legally, a religious leader can stand in front of the general or in front of their congregation and state, we believe this is good or bad policy or law and we suggest you should vote for or against it." CLAIM: "If it passes, we would lose jobs in every community across our state. Not just in oil and natural gas, but in every industry." VERDICT: Job loss could be a reality, but "every community" might be an overstatement. Protect Colorado provided documentation that cites a study by the Common Sense Policy Roundtable. 9NEWS has not vetted the full report. 9NEWS spoke with a University of Colorado economist about how economists come to conclusions based on formulas that predict future outcomes. The economist said that if our economy contracts because of policy changes, then certain industries would forgo job growth. If Proposition 112 passes, it will not impact current oil and gas operations. It will significantly limit future sites on state or privately-owned land (the white areas on the following map), but it will not impact federally-owned land. If there are fewer future sites for oil and gas operations, there could be fewer jobs available in oil and gas. According to the economist we spoke with from CU, the formulas take that type of industry job loss into consideration when determining how other industries would be impacted. For example, fewer jobs for oil and gas extraction could mean less need for new apartments or homes to be built. Also, a reduction of local, state and federal tax dollars could result in a trickle-down impact on governments and occupations paid for with tax dollars, like schools. However, it's an overstatement to say this will impact "every community." 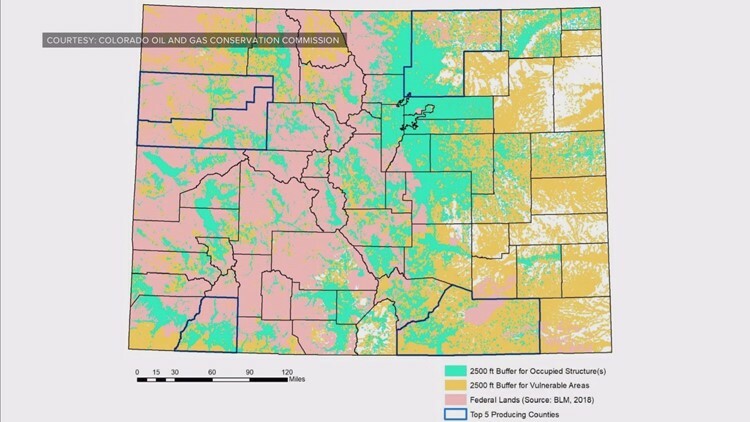 Clearly, Weld County, where the majority of oil and gas operations happens in Colorado, would be impacted by direct job loss, but maybe not every county. CLAIM: "It will harm our entire economy for generations to come." VERDICT: This is unknown and there is data that suggests it's an overstatement. In 2014-15, when the demand for oil dropped, so did the oil and gas industry's contribution to Colorado's economy. However, based on gross domestic product data maintained by the U.S. Bureau of Economic Analysis, Colorado's overall economy continued to increase during the same time that oil and gas decreased. BOTTOM LINE: There will likely be an impact to oil and gas jobs if there are limited sites for future oil and gas operations. How it will impact jobs in other industries is not clear, but formulas used by economists quantify for trickle-down effect on other professions. Fewer oil and gas operations could result in reduced local and state tax revenue (property and severance tax), which could impact local and state budgets. It is an overstatement to say it will harm our economy because history has shown Colorado's economy can continue to move in a positive direction even when the oil and gas industry has had a downturn.